Bridal showers are prenuptial rites of passage in North American culture. A 2016 survey conducted by wedding planning website BRIDES.com revealed that more than 63 percent of brides had a traditional bridal shower. A bridal shower is a fun occasion for the bride’s friends and loved ones to gather for food, drinks and to share stories and advice while celebrating her upcoming wedding. It’s also a time to shower the bride with attention and gifts to help the new couple establish their home. Bridal showers are usually held about two months before the wedding and are traditionally given by the bridal party, along with the bride’s mother, sisters or close friends. 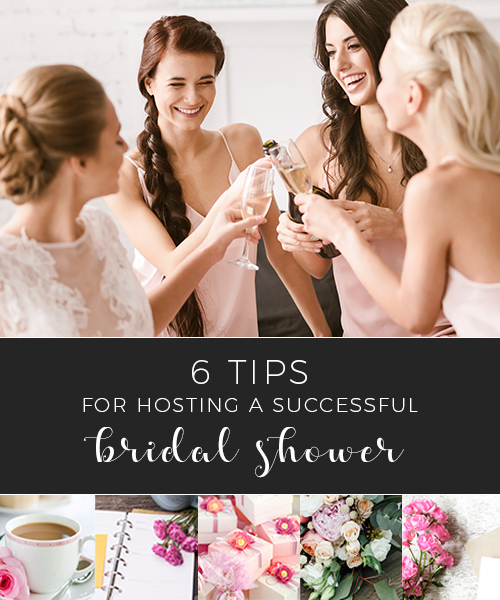 No matter who is ultimately in charge of hosting the shower, dividing duties and costs among all involved can help keep the host from getting overwhelmed and allows everyone a chance to contribute to the bride’s special day. Your bridal shower can be a huge success with careful planning and a little know-how. From choosing the theme and menu, to sending out the invitations and planning games your guests will enjoy, there are many helpful tips and ideas that will help you plan a spectacular bridal shower the bride will adore. While bridal showers were often a surprise in the past, these days it’s perfectly acceptable for the bride to be involved in some or all of the wedding shower details. If the element of surprise is a must, disclose to the bride only the date and time of the shower. That way, she has some control over the planning, but will still be surprised when she sees all the unique details. She will surely thank you profusely for allowing her time to prepare her outfit, rather than walking into a roomful of guests in her gym clothes. Consulting the bride also ensures the guest list is accurate and will include everyone she would like to invite. In addition, you can gather her input on what themes or activities she may want to include or forego. Finally, it gives the couple a deadline for completing their registry information and ensures the proposed shower date works with their schedules. When beginning to plan the shower, it’s essential to make sure you check the schedules of not only the bride, but other VIP guests such as the bridal party and the immediate family members of both halves of the couple. While it may not be possible to accommodate everyone’s schedule, it’s important to choose a date that is suitable for most. Once you’ve set the date, select and book the venue, if necessary. These days, it’s acceptable to host bridal showers just about anywhere, including at the home of the host or another friend or family member, restaurants, parks, hotels and even spas and wineries. Community centers, clubhouses and fraternal organization centers offer amenities such as kitchen areas and tables and chairs, along with spaces capable of accommodating large groups. Wherever you choose to host the bridal shower, just be sure it’s somewhere the bride will enjoy. Sticking to a bridal shower theme provides direction to both you and your fellow planners and makes it easier to coordinate all the little details — from invitations and linens to the menu and even the favors. Since there are so many different bridal shower ideas, the easiest way to narrow down the list is to choose a theme the bride enjoys. For example, if she is in love with all things romantic and Victorian, an elegant tea party-themed shower is in order. 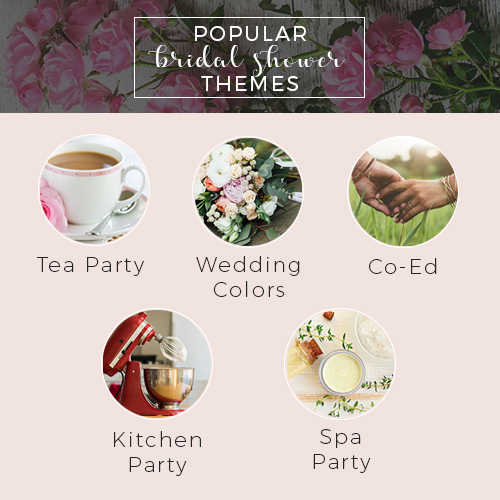 A recent bridesmaid survey by the Ultimate Bridesmaid website showed that 53 percent of participants chose “tea party” as their first choice of bridal shower theme. Tea Party: This classic theme can be carried out by adding special touches such as salad served in teacups and a table with an assortment of teas and delicate finger sandwiches. Invite guests to wear their prettiest and most colorful hat, or provide hats and other fanciful accessories at the shower. Décor may include lace tablecloths, mismatched china place settings and toile linens. You can also tie in additional themes such as vintage or glam. Wedding Colors: Tying in the wedding colors throughout the shower, such as in the linens, florals, plates and other décor, is an easy theme to follow. You can also be sure the bride will approve. Co-Ed: Many modern couples opt for a co-ed shower (sometimes called a Jack and Jill shower) where both men and women are invited. Co-ed showers usually include different activities than at traditional bridal showers, such as sports and wine or spirits tasting. Kitchen Party: For this fun and functional theme, guests bring an item for the bride-to-be’s kitchen. Choosing kitchen items from the bridal registry ensures the couple receives their most-wanted kitchen items. Incorporating a cooking activity or food stations such as a make-your-own-pizza or waffle station is an engaging way to carry out this theme. Spa Party: In the same Ultimate Bridesmaid survey mentioned above, the “spa party” theme took second place, with 37 percent of the vote. Depending on the budget and size of the guest list, you may want to reserve an actual spa. If you’d rather have a cozy spa party at home, there are many DIY spa treatments and activities to incorporate into the theme. In addition, you can invite guests to wear their favorite fuzzy slippers or robe. Themes can even be carried over into the shower gifts. Honeymoon items, bar supplies, books and even lingerie have become popular “wishing-well” items, which are primarily themed items requested to help stock the couple’s home. Once you have established the theme, it’s time to think about the bridal shower food. When planning a bridal shower menu, your choices of food and drink will most likely be determined by the theme, time of day and by the bride’s taste. Since showers are usually held in the late morning or afternoon, lunch and brunch foods are both popular and appropriate. You may also want to try to incorporate some of the bride’s favorite foods into the menu for a more personal touch. Consider a potluck luncheon or brunch where members of the bridal party and other friends or relatives that are helping host the shower each bring an item or dish. This helps keep the price down and ensures the food duties are equitable. You may also choose to have all or some of the food catered. If using a caterer or having the shower at a restaurant, be sure to make your food choices early and discuss the menu with the caterer or banquet manager. You don’t need to serve a full meal unless the shower is being held around dinnertime or for longer than a few hours. Appetizers, finger foods, meat and cheese plates and other light fare are perfectly acceptable for bridal showers. Continental breakfast foods such as quiche, pastries, fruit and coffee are elegant and filling choices for a brunch. Don’t forget the mimosas! Speaking of mimosas, they make a fun and elegant beverage table when presented with metallic printed napkins, lovely champagne flutes, different types of juices and bowls of fresh fruit. You may also want to whip up a dazzling bowl of punch, complete with matching crystal glasses. If serving alcohol, provide a non-alcoholic option for guests who don’t wish to imbibe. Food stations are becoming popular bridal shower features. These are an easy way to fill up your guests and allow them to get up, move around and mingle. Interesting food tables also effectively keep guests engaged during downtime, such as when the bride is greeting guests or opening gifts. Taco Bar: Complete with meat, cheese and all the necessary taco fixings. Bruschetta Bar: Mini crostini bread with various toppings such as tomatoes, pesto and other tapenades. Yogurt Parfait Bar: Yogurt, fruit and granola. Perfect for a brunch shower. Candy and Sweet Bar: Candies, cookies and other sweet treats. Provide guests with bags to fill and take home as bridal party favors. Ending the shower with a sweet treat is a must for keeping your guests happy. While having a shower cake is traditional, you may decide to buck tradition and serve decorated mini donuts or cookies instead. Consider serving dessert while the bride is opening her gifts to keep things moving. When it comes to bridal shower invitations, the choices are as varied as weddings themselves. Invitations can be handwritten, professionally printed or DIY. With so many elegant styles available, choosing the perfect invitation can be difficult. However, incorporating the colors or theme of the wedding or shower is an efficient way to narrow down your choices. Invitations should be sent out about a month before the shower. Be sure to get a guest list from the bride or someone close to the wedding planning, as it’s common etiquette to only invite wedding guests to the bridal shower. Consult the bride about who she would like to invite, as she may want to include only close friends and relatives. Card stores sell elegant blank invitations that can be written out by hand. Many websites such as Etsy offer inexpensive templates that you can download and use to print your own beautiful invitations. Special card stock and envelope kits are available at most craft and office supply stores. If you wish to have invites professionally printed, many websites offer this service as well, along with numerous design choices. If you choose to go paperless, some websites will allow you to create, send and manage your bridal shower invitations and RSVPs. While it may be tempting to send out an Evite or share a Facebook event, it’s important to remember that not all guests may be tech-savvy and therefore will not receive them. One option would be to send out Evites to guests you know are sure to receive them, and send paper invitations to the other guests, such as parents, grandparents and other close relatives. Invitations should include the correct date, time and place where the bridal shower will be held, along with any other special requests, such as wishing-well items, advice or recipes. Include the places where the couple is registered. Advise guests of the wedding shower theme and menu, if it’s relevant to their shower preparation. Weigh your complete invitation with the envelope and any other add-ins to ensure you have the correct postage. Last, but not least, be sure to triple-check for any mistakes before sending out your invitations. Bridal shower games are a fun way to keep your guests engaged. Not only are they enjoyable to play in a group, but they are also an excellent way for people to get to know each other, since most of the guests at the shower will also be attending the wedding. Games about the couple and how everyone knows them are great icebreakers and work well with guests of varying age ranges. There are many options for bridal shower games. However, a word to the wise is to keep them classy. Consider that your crowd will most likely include guests from the couple’s families. For this reason, it’s not the time to share any embarrassing or risqué stories or indulge in naughty bridal shower games that will make Grandma blush. There’s usually at least one person who gets very excited about the preparation and planning of the games. Enlist that person to oversee planning, gathering supplies and overseeing the games at the shower. Providing small prizes (such as candy, nail polish or gift cards) for the winners is another fun way to keep your guests engaged and usually helps persuade more guests to participate. Bridal Shower Bingo: This ever-popular bridal shower game, where players receive cards with the word BRIDE across the top instead of BINGO, is a staple for many reasons. First, most everyone already knows how to play, and second, it’s easy to vary the game according to things such as gifts the couple receives or places or facts about the couple. Purse Raid: This fun and exciting game is basically a scavenger hunt inside guests’ purses. Have a list of items from common to unusual, and call them out one by one. The first person who pulls the item from their purse or bag receives a prize. Words of Wisdom: Invite guests to fill out decorative blank note cards with either words of advice, a favorite recipe or any other piece of information they would like to share with the couple. Guests can take turns reading these to the bride at the shower. They can then be assembled into a scrapbook that will become a treasured gift. If you choose this option, be sure to include requests in the invitation and ask guests who are not able to attend the shower to mail their contributions back. Memory Lane: In this game, guests have to figure out who did what with either half of the couple. Have guests write down their favorite memory or adventure (e.g., which person helped the bride pull a prank during college?). Once collected, read them aloud, and guests will have fun guessing and hearing the accompanying stories. Some hosts opt to have alternative activities instead of the traditional bridal shower games. Food and wine tastings, spa services, cooking or yoga classes or even art or painting activities have become popular bridal shower activities. These activities are perfect for incorporating into shower themes such as Jack and Jill, kitchen or spa party. It is a thoughtful gesture to give each guest who attends the bridal shower a small token of thanks. There are many fun and unique ideas available for favor ideas. They don’t have to be big or expensive to be appreciated. Any item that is small, useful or personal makes a perfect bridal shower favor. Bath salts, nail polish, jars of preserves or honey, cookies, candles or potted herbs or plants are just some of the many favor ideas that are popular today. Favors are also a chic way to carry through the theme of the shower. Elegant tea bag holders or a small tea sampler for a tea party-themed shower. Beautifully decorated cookies in various shapes and themes (available at many bakeries and online). Lovely wooden spoons or small kitchen utensils for a kitchen-themed shower. Bath salts or body scrubs for a spa-themed shower. While guests will surely want to remember the wonderful time they had at your shower, they will no doubt appreciate a favor that is useful and personal to them. Whether preparing food for a large crowd, organizing food stations, looking for special recipes or planning a kitchen-themed affair, Ceramcor has everything you need to host a successful bridal shower. Our products also make great wedding gifts. Visit our website today and start planning a bridal shower she’ll remember forever.